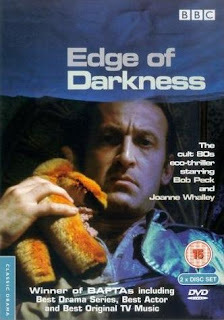 In some circles, Edge of Darkness is regarded as the Citizen Kane of BBC mini-series. First broadcast in late 1985, it won an absolute ton of awards, including BAFTAs for Best Series, Best Actor (Bob Peck), Best Music, Best Cameraman, Best Sound and Best Editor. It made stars, in some cases rather briefly, out of Bob Peck (best known to US audiences as big game hunter Muldoon in Jurassic Park) and Joanne Whalley (who went on to star in Willow and marry Val Kilmer) and bolstered the profile of director Martin Campbell, who later helmed the James Bond movies (GoldenEye and Casino Royale). The musical score is highly distinctive, the result of a collaboration between composer Michael Kamen and guitarist Eric Clapton. Yorkshire police detective Ronald Craven (Peck) is investigating election rigging in the union of the local mineworkers when his daughter, Emma (Whalley), is shot dead in front of him. The police investigation works on the basis that it was a revenge killing by someone Craven put away, but Craven starts uncovering evidence that his daughter was involved in a secretive organisation called 'Gaia', which is opposed to the spread of nuclear power in Britain. After travelling to London to help further the investigation, Craven is contacted by two British intelligence agents who believe there is a connection between the murder and a covered-up break-in at the Northmoor nuclear power station. The US government, which is trying to get its hands on as much plutonium as possible for its Cold War arsenal, also takes an interest and assigns CIA agent Darius Jedburgh (Joe Don Baker) to help Craven with the investigation. Throughout the investigation, Craven is suffering from shock and trauma over his daughter's death, and finds himself only able to cope by imagining that Emma is still alive and able to help with the investigation. Edge of Darkness is, bizarrely, almost more topical today than it was almost a quarter of a century ago. Once again Britain finds itself riven by controversy over nuclear energy and environmentalism, and after a decade or so of being out of the spotlight, James Lovelock's Gaia theories again seem to be becoming more popular. However, it is the writing and acting that makes the serial so compelling. Peck gives a strong performance as the shell-shocked Craven and Whalley is effective as his daughter (in both her 'real' and arguably 'supernatural' states), but it is Joe Don Baker as the golf-obsessed, Come Dancing-watching, gun-toting, one-man army Jedburgh who steals every scene he is in. Baker shades the character enough not to turn him into a cliche, although the slightly bizarre turn his character takes in the final episode may have been a case of the writer realising he's created a badass character they audience might end up rooting for and trying to head that possibility off, with mixed results. There are also excellent minor turns from actors such as Ian McNeice (best-known to US audiences probably as Baron Harkonnen in the Sci-Fi Channel's version of Dune) and Zoe Wanamaker (Madam Hooch in the third Harry Potter movie, probably better-known for her role in the long-running BBC sitcom My Family). This is a superior drama. The writing is tight and the revelations are logical and well-played. The hypocrisy of the politicians and businessmen involved (who seem to be deadly rivals one moment, and then best friends once their interests align) is excellently depicted. However, it does stumble in the last episode. The series feels like it should have ended with the fifth episode, with Craven and Jedburgh mounting an infiltration of Northmoor and uncovering the secrets there. The final episode, disappointingly, comes across as more of a writer's polemic with the formerly subtle exploration of the themes rammed down our throats in a rather obvious manner. However, the final scene and the symbolism of what it means for the long-term survival of the human race, remains powerful. Edge of Darkness (****½) is a haunting, compelling mini-series. That it falls at the last hurdle shouldn't take away the quality of the earlier part of the story. It is available on DVD in the UK and USA. Martin Campbell is currently shooting a cinematic remake of the story, with Mel Gibson starring as Craven and Ray Winstone as Jedburgh, for release in 2009.